I am a life-long Los Angeles Dodger baseball fan. Carla and I both grew up in Southern California and our fathers were both fans, as are my son and grandson. There are a lot of great Dodger players, but perhaps not one as well-known as Jackie Robinson. Robinson broke the color barrier in baseball, becoming the first African-American to play in the National Baseball League for the then Brooklyn Dodgers. His story was played out in the movie “42”, which was in theaters a few years ago. As I was reading the book “42”, a biography about Jackie Robinson’s life, I was impressed at the influence his mother had on his life and character. I don’t think he would have been able to break the color barrier in baseball had his mother not taught him about her faith in God. The seventh of fourteen children, Mallie McGriff Robinson had grown up on land owned by her parents and gone to school up to the sixth grade – no small feat for a black girl in rural Georgia. Born slaves, Wash and Edna McGriff had pressed education on their children. When Mallie was ten, she repaid her father by teaching him to read his beloved Bible. Mallie married Jerry Robinson. They were tenant farmers in Georgia. After multiple affairs, Jerry left her for another woman when Jackie was just 6 months old. As a single mother with five children to raise, she packed them up and took a train to Southern California where she worked as a domestic housekeeper. Mallie took her kids to church and taught them about her faith in God. In tough times, as she worked from sun up to sun down, she would often say, “my faith in God is my compass,” Jackie recounts in the book. She wanted the best for her kids, which is why she held her kids to a high standard and pushed them to do whatever they could to the best of their ability. 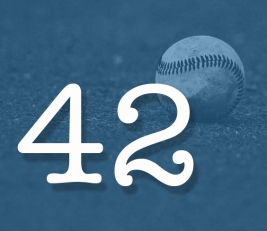 Today, every year on April 15, every major league baseball player wears Jackie’s number “42” on their uniform because of his integrity and for what he accomplished in baseball. The number “42” has been retired in his honor and will never again be worn by another player. At this time of year when Moms are celebrated, it is my hope that you can follow the example of this great woman of God. Mallie Robinson was a single mom with five children. She purchased a home in 1923 and taught her kids to work hard and do their very best at all times. In addition to Jackie’s success in baseball, her son Mack Robinson ran the 200 meter dash at the 1936 Olympics, winning the silver medal by placing 2nd behind Jesse Owens. When you get discouraged as a parent or life has dealt you an unkind blow, don’t give up or give in to your feelings of despair. Like Mallie Robinson, let your children see your trust in God by reading your Bible, praying for your family and living the life God has given you to live. Share your heart with your kids and say what you think they need to hear to grow and mature in their faith until they can take ownership of it themselves. You will never know what you have taught them about God that will guide your kids to follow God. Let them see the glory of God shine through any circumstance you find yourself in. Just as Jackie’s mother taught him how to live in a very unjust world, our kids need to learn how to live in an ungodly culture that ridicules Christianity. Plant seeds of biblical truth in your home and let God do the rest.